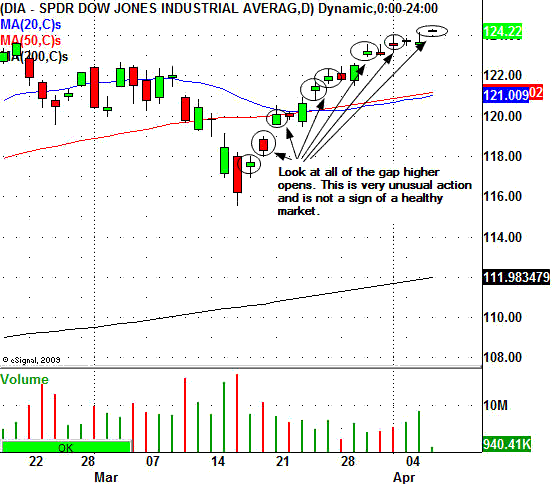 The major stock indexes have certainly staged a sharp rally since the March 16, 2011 pivot low. The Dow Jones Industrial Average (DJIA) has gain 886.00 points in just 16 trading sessions. This is a major move for the markets in such a short time. The amazing fact about this three week rally is that the major stock indexes have had eight gap higher opens in the past sixteen trading days. Therefore, fifty percent of the time the market has gapped sharply higher to start the day. This is very unusual action for the major market indexes. Continued gap higher opens will usually end in a sharp reversal day, however, that has not occurred and the markets remain strong at this time. When you think of all the negative news that has been thrown at these markets it is really amazing to see the rally from the March 16, 2011 cycle low. However, traders must be aware that gap higher opens usually do not last and are not a sign of a healthy rally.